This salad was very tasty! 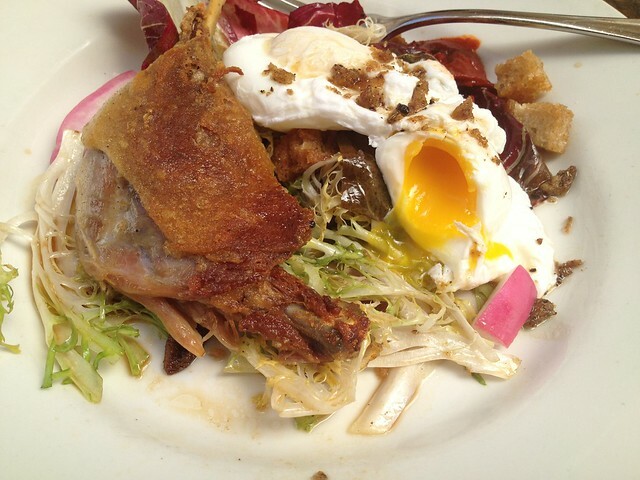 I loved the poached egg and the crunchy croutons. 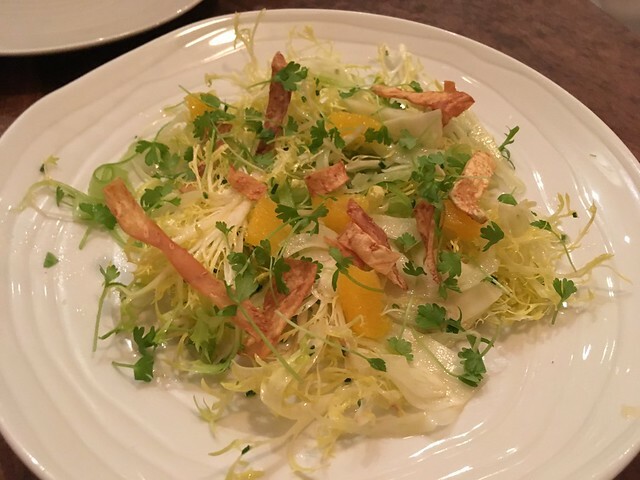 Perhaps some people would think this salad was a bit tart from the sherry vinaigrette but I enjoyed its brightness. 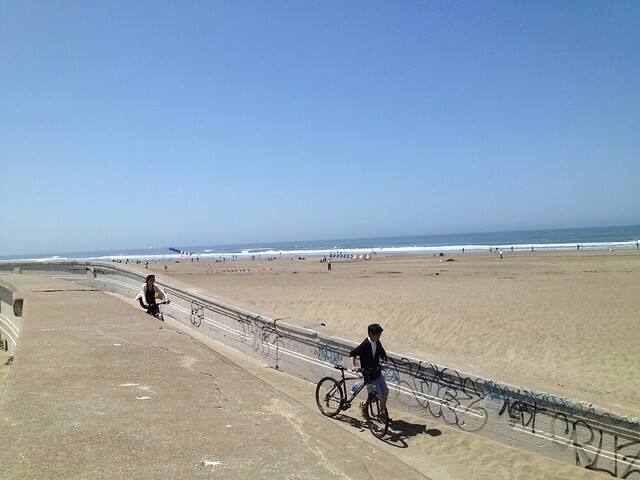 Omg, I love State Bird! Their American dim sum fare is fun and delicious and they have amazing service. The hipsters who work there are super friendly and accommodating. 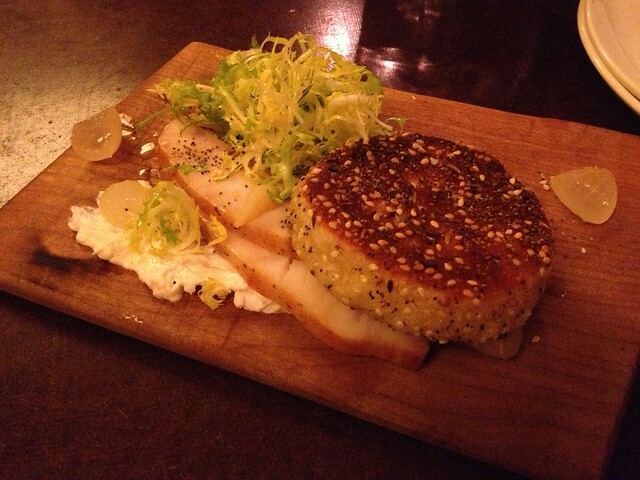 This smoked sturgeon pancake was my favorite dish during our first visit. We’ve been there a couple times now, and this dish is still one the best! 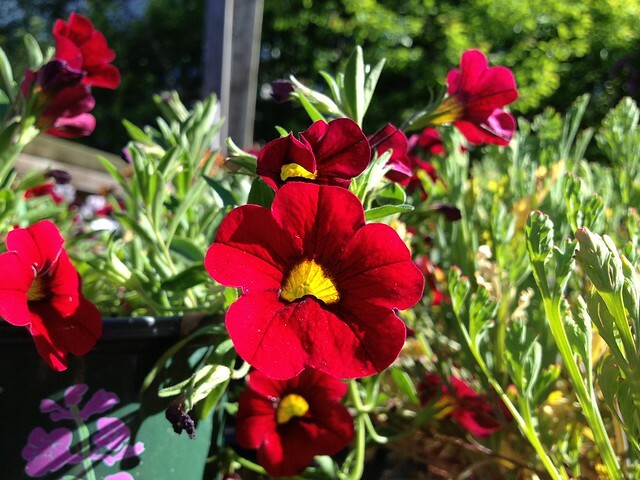 Red Calibrachoa ‘MiniFamous Vampire’ flowers (Solanceae). Omg, this was SO good and everything was cooked beautifully! 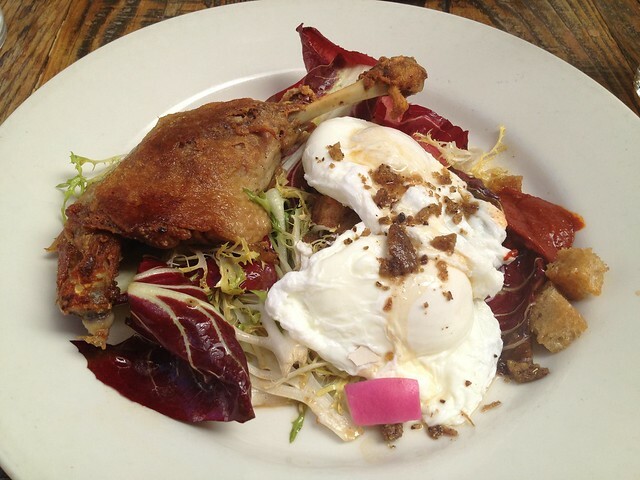 The duck was delicious as were the poached eggs. The five spice cracklings were a fun and yummy addition. 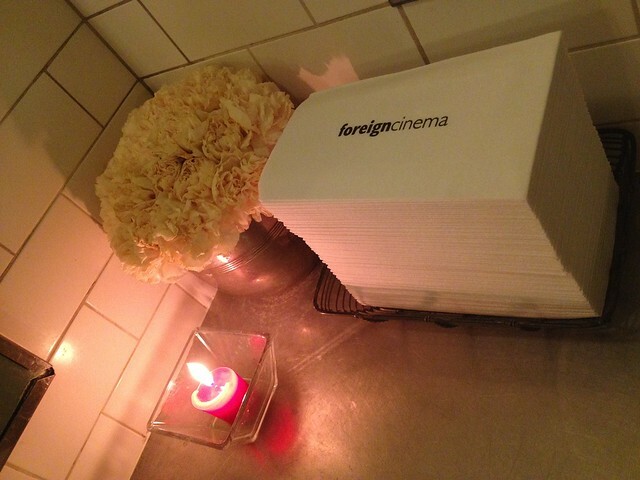 I thought it was cool that Foreign Cinema had branded paper towels in their bathroom. So classy, lol! This was SUPER good! When I read the menu item, I thought it was going to be more like calamari a la planxa – something whole and more dry. I was pleasantly surprised when this more salad-y dish arrived! I will say that there was A LOT of dressing on the squid, but I really didn’t mind because it was so good. It’s some of my favorite flavors and I’m gonna admit that I even used some bread to soak of the leftover dressing at the end, lol! The squid had a nice texture that wasn’t rubbery and the dish was quite large for an appetizer portion, heck yeah! I would definitely order this again. Bread and butter. Complimentary. Crusty bread with real butter = happy me! Red endive, frisee, red pear, candied walnuts, pomegranates, and Humboldt Fog goat cheese with mustard vinaigrette. Menu says $11 but receipt says $12 – BOO, LAME!!! So the price discrepancy is totally lame! I don’t know if the menu wasn’t updated or out server was completely brain dead. I did mention during dinner that our server wasn’t very good compared to the server at the next table. Ours didn’t even give us the specials before we ordered. 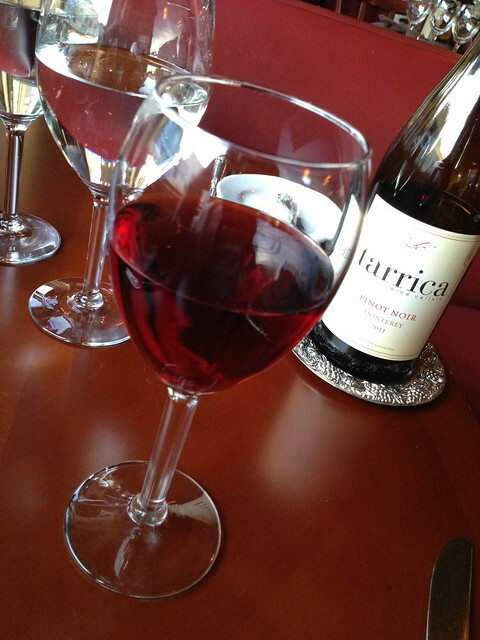 I didn’t even know there were specials available until the server at the adjacent table told her guests! Whatevs, our server was definitely “slow”, if you know what I mean. This salad was tasty, but not very original. Red bell pepper soup. Complimentary. I really liked this shot of free soup. It was hot and very flavorful. 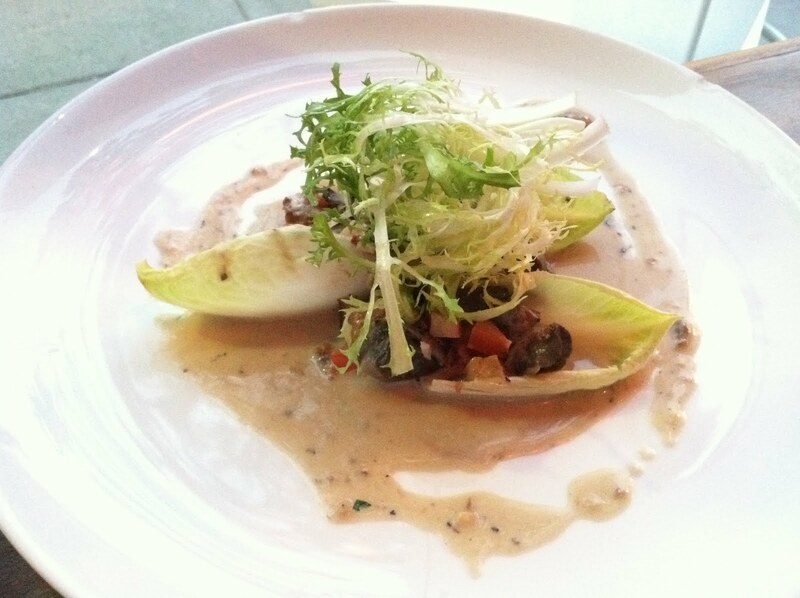 Snails in Belgian endive leaves with seasonal mushrooms, tomatoes and bacon cream sauce, topped with frisée. This appetizer has a great combination of light and rich elements. 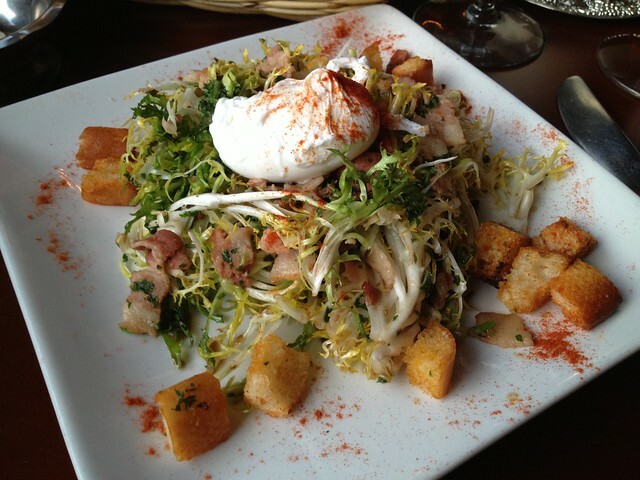 The bright endive and frisée help to balance out the richer escargot and cream sauce. I particularly enjoy the use of endives for appetizers. They provide the perfect bite sized boat to stuff delicious ingredients into!